Esperanza Spalding challenges and redefines modern music! Esperanza Spalding is in the midst of a huge career evolution. Having emerged in the early 2000's as the anointed savior of modern jazz (who beat out Justin Bieber to a Best New Artists Grammy), she's dispatched with her traditional arrangements as she creates her brand new work, 12 Little Spellas, taking jazz into a whole new progressive direction. Her accompanying tour is an eclectic mix of music, narrative and performance art, which really delves into healing and giving the audience member or listener and truly tingling sensation. The four-time Grammy winner contiunes to push the boundaries of music and music performance, not one to stick to any one style Spalding's multi instrumental talent keeps her fresh and at the top of her game. 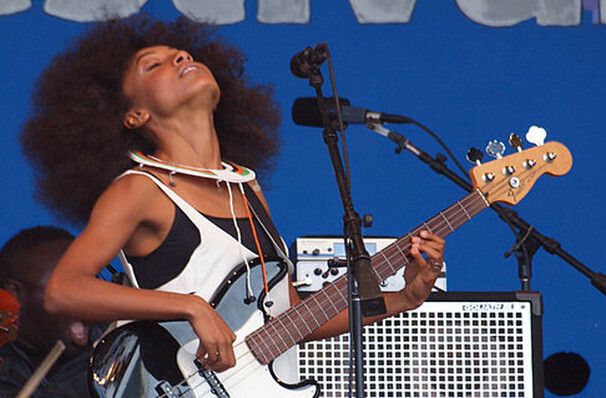 Is there anyone like Esperanza Spalding? We don't think so. Sound good to you? Share this page on social media and let your friends know about Esperanza Spalding at House of Blues. Please note: The term House of Blues and/or Esperanza Spalding as well as all associated graphics, logos, and/or other trademarks, tradenames or copyrights are the property of the House of Blues and/or Esperanza Spalding and are used herein for factual descriptive purposes only. We are in no way associated with or authorized by the House of Blues and/or Esperanza Spalding and neither that entity nor any of its affiliates have licensed or endorsed us to sell tickets, goods and or services in conjunction with their events.